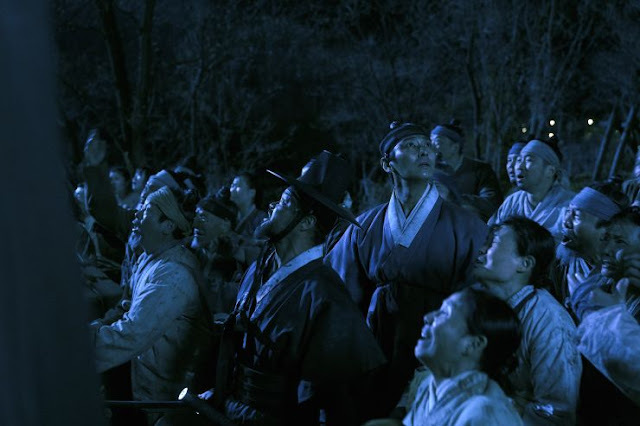 Royal horrors come to life when an epidemic plaguing Joseon stems from the King's palace. 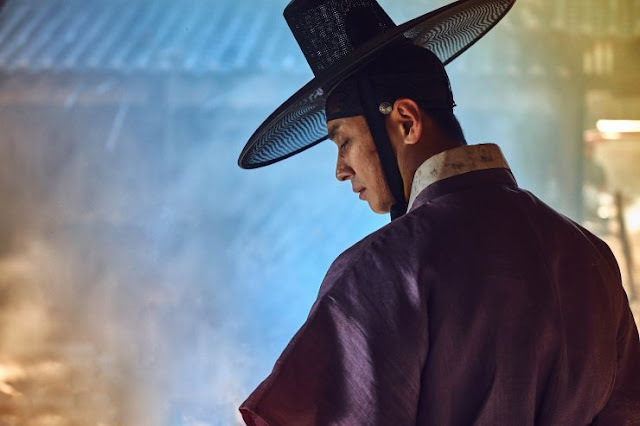 The first series instalment tells the story of Crown Prince Lee Chang (Ju Ji-Hoon) who attempts to track down the Physician attending the King under the suspicion that his father is already dead, and that a Kingdom continues on without its King due to false pretences by the Queen. 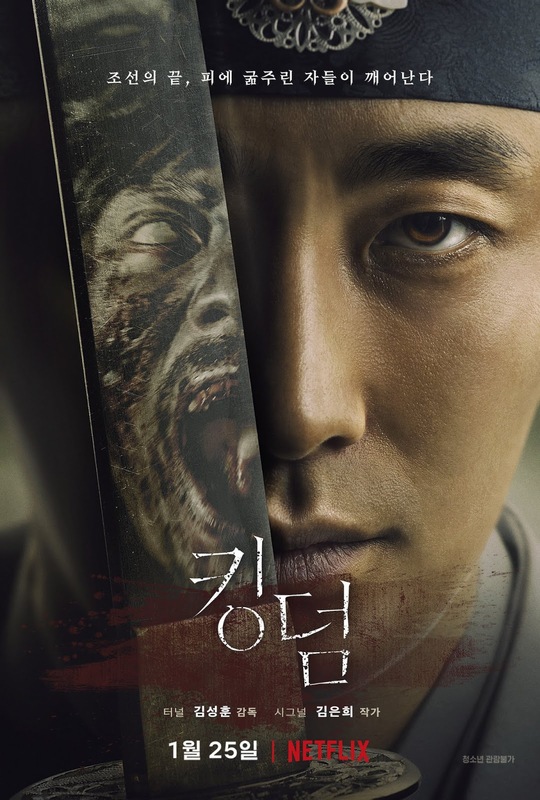 Accused of treason and uncovering unfathomable truths along the way, Lee Chang continues on his suicide mission before an outbreak turns all his subjects into zombies who crave human flesh. 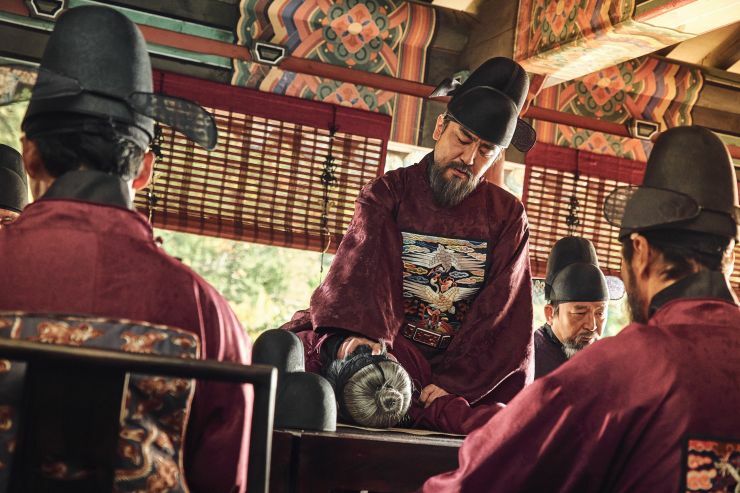 Coveting the throne and power throughout Joseon, Nobleman and Advisor Cho Hak-Jo (Ryu Seung-Ryong) aims to end the Crown Prince's life amidst the chaos of blood and death, being the instigator of the horrifying eruption of events taking place. 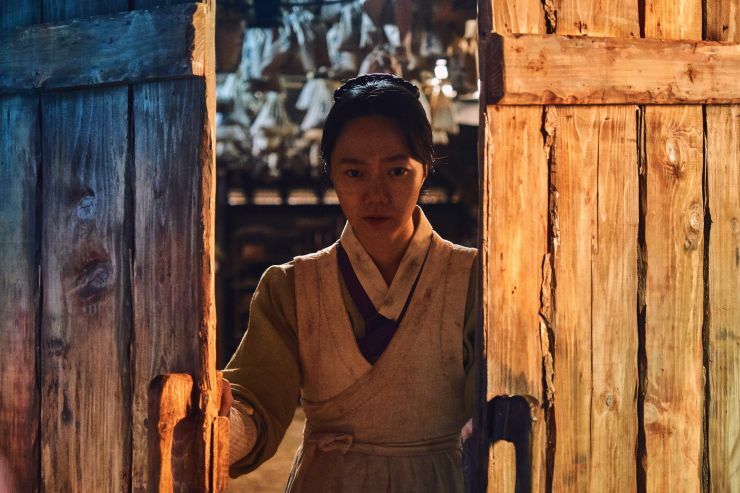 Meanwhile, female Physician Seo-Bi (Bae Doona) who knew the man the Crown Prince seeks, discovers a rumoured belief that a plant exists to resurrect the dead, and may be the antidote to counter the disease. 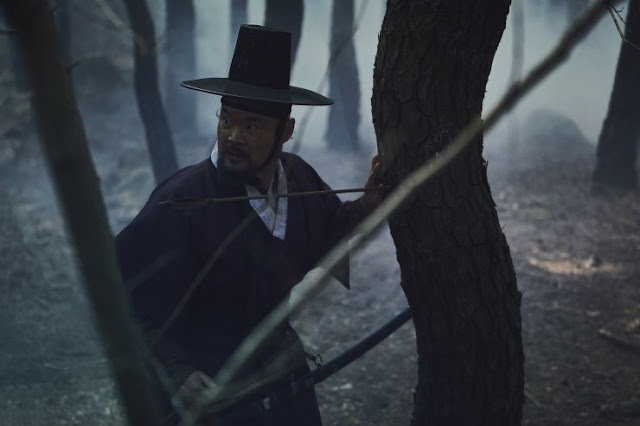 I'm still reeling from the suspense since this was a fantastic fusion of Sageuk and supernatural-horror. Kim Eun-Hee has outdone herself to intersect multiple genres and create a tale entirely different from her last work, Signal which garnered much acclaim and recognition. It's a grand feat for a Writer to be able to specialize in various genres but she's managed to do so, in order to deliver a seamless zombie apocalyptic series that follows a Prince's quest to save his kingdom. 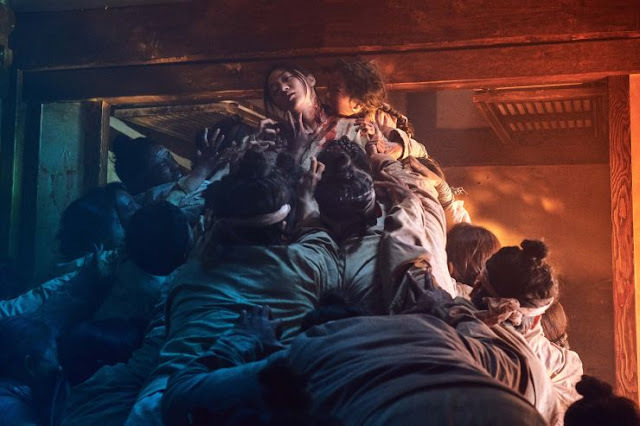 The zombies themselves are identical in appearance to the ones in Train to Busan and I wouldn't be surprised if Kim Eun-Hee drew some ideas from the movie to formulate her own Joseon zombies.Yet unlike the modern doomsday film, Kingdom contains greater intricacies that merge with the horrors of the undead. 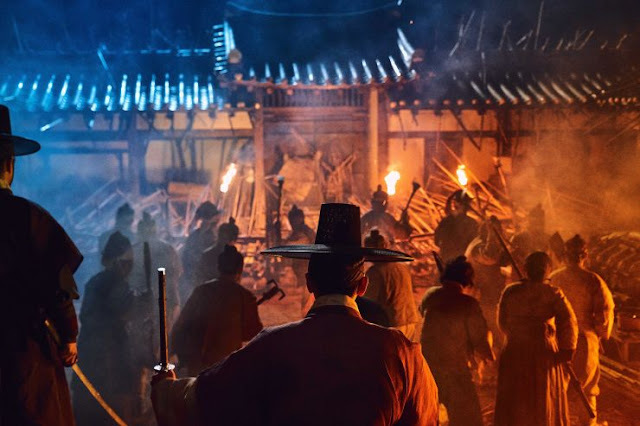 As a K-drama fan, I've seen my fair share of royal conspiracies or political wars, and most of them are quite predictable and even staple aspects of a historical drama, becoming a series of events that are necessary and formulaic but this is one show with fluidity and steady movement as the plot progresses. The story never stagnates and the execution of royal turmoil, power play, and cannibalistic illness are delivered within a framework of a consistent and complex narrative that creates intensity and suspenseful cliffhangers. 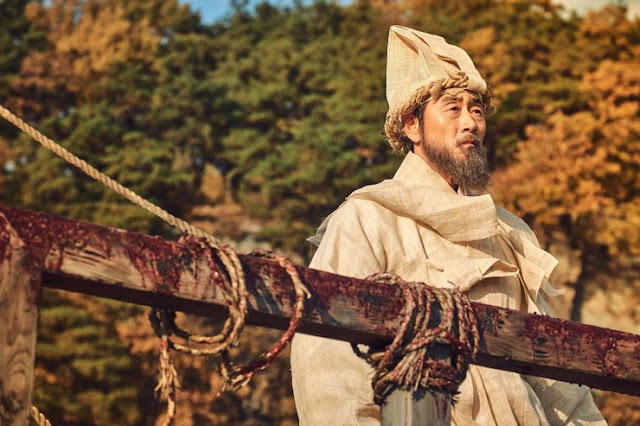 The names of the actors speak for themselves, and Ju Ji-Hoon specifically never disappoints in a role. He seems to be venturing into unknown waters to play more versatile roles and is making a name for himself with fantasy and supernatural. From a Grim Reaper in Along with the Gods to his next upcoming drama series, Item, the actor is taking on dynamic roles within the genre which gives him a sense of ease and deeper understanding of his characters. Crown Prince Lee Chang in particular, is humanistic and in some cases quite average underneath his exterior encasing turbulent emotions but his duty to the Crown and nightmare encounter with the dead, gives rise to character growth, forcing him to be the leader Joseon needs. There is however a dark satirical narrative or mythos of the wealthy in parallel to the Crown Prince's growth since those born of nobility wind up dead. The heinous epidemic turning people into zombies falls upon them as a curse for their misdoings and aristocratic privilege. While the Crown Prince sacrifices his life for commoners, nobles flee without extending a helping hand and are punished for it. I have to say that this adds more meaning into the series and there's plenty of context about wealth and power and how corruption and greed amplifies during chaotic times. So even among all the action and gore, moral commentary lies within the dialogue and plot for the audience to digest. There's a lot to discuss but in doing so, I'd be revealing too much and ruining the suspense! It's fast-paced, well-written and gripping, with incredible cinematography and acting. This drama might end up being your favourite fantasy series of the year, and with it's dark matter and approach to horror, you'll enjoy every moment of it and question who'll reign during a zombie apocalypse. Yay. Movie binge night it is. I thought it was a movie but turns out it was a series instead... Nevertheless loved it!! Can't wait for season 2. I was just watching the first 3 episodes with my siblings and so far I have yet to be disappointed. The way the show was shot was amazing and really well done. I absolutely do not like shows like this because it's just too intense for me sometimes (lol), but I would recommend this show to anyone who enjoys intense dramas with mystery and somewhat if a thrill. There were many moments where I was just straight up annoyed with some of the characters because of how stupid they were. I seriously hope that they can kill off the zombies soon but it looks like there will be a season 2.
to be fair, they didn't have any arsenal or knowledge about zombies so bearing with the characters and their stupidity as they learn more about zombies was painful but necessary xD I hope the outbreak ends with some kind of medicinal miracle because that's a lot of heads to severe otherwise. And season 2 is set to go into production next month so we might see season 2 by summer. That, I’m aware of. The annoying characters were the ones that would not agree to burn/behead the bodies because it contradicts their beliefs/culture, which I understand that part. 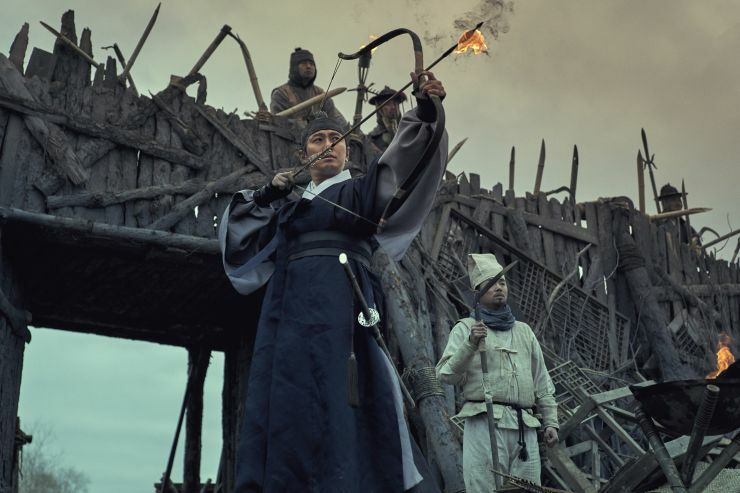 But the main lead already told them that the only way to stop them is to either burn them or chop or their heads. Burying them was not going to stop them. No one wanted to listen to him even then. Instead they wanted to harm the people instead of doing what’s best for the country. Like dang, yall really want to die instead of saving yourself even after all the information and proof has been laid out before your eyes. Sigh. That one guy that works with the magistrate is so annoying too. Thanks for the review! I hadn't heard of this one and am now intrigued!